It is getting near the end of the week and I was looking into cleaning out my fridge. Among other things I had a half an aubergine, a half of a roasted red pepper, some marinara sauce and some goats cheese. I remembered seeing a photo of some stacked eggplant slices and decided to make an eggplant tower. I really like grilled eggplant so I grilled the eggplant slices first. It turned out pretty good though it was a bit light. The eggplant that I had was rather small and there was not enough left for a second so I added a salad to complete the meal. Broil the eggplant slices until golden brown, about 7 minutes per side. Mix the goats cheese, roaster red pepper and parsley. Place the marinara sauce on the bottom of a baking pan. Place one slice of eggplant on the marinara sauce. Place half of the goats cheese mixture on top of the eggplant. Place the other slice of eggplant on the goats cheese mixture. Top with the remaining goats cheese mixture. Bake in a preheated 350F/180C oven for 10-15 minutes. Note: You can broil a fresh red pepper at the same time as the eggplant if you do not have roasted red pepper. Congratulutions – you are getting Elly to try eggplant, and she’s actually excited about it! (I’ve tried to convince her in the past, to no success.) 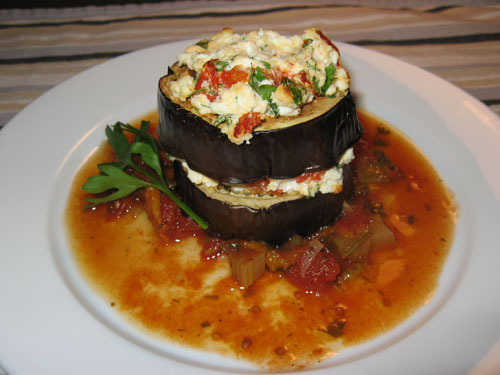 Eggplant and goat cheese are wonderful together! Wow Kevin. You are progressing by the minute into elaborate gourmety meals! These look so pleasing to the eye and probably taste just mouthwatering. I agree with Elly, just throw on some goat cheese and I am hooked!!! This is so beautiful and so creative! Oh Kevin (said in whisper tones) 🙂 You make me want to eat eggplant and I am not an eggplant lover. The food looks delicious, Kevin, and it’s so beautifully presented! I’ll have to try this one. I’m always looking for new ways to use eggplant that does not require a lot of oil. That looks gorgeous! Love the goat cheese and the bit of marinara. And if it’s done on the grill mon mari is happy! I love eggplant and goat cheese, so I will definitely try this. If you're looking for another eggplant recipe you should look up a recipe for "kashk badenjan." It's a persian eggplant stewish thing with lentils, spices, mint.. it's rly yummy.